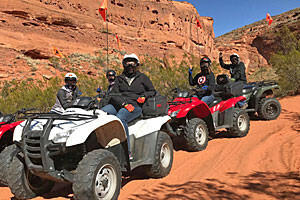 Red Cliffs Recreation Area is more than just a beautiful campground set by sandstone cliffs and Quail Creek; it has fun hiking trails passing a pioneering cabin, ancient Anasazi sites and even dinosaur tracks. Hike into the Red Cliffs Desert Reserve to see the incredible variety of plants and wildlife there. Visit the Orson Adams Cabin, built by the early Mormon pioneer in 1863. Hike the Anasazi Trail to learn about the group's history and see dinosaur tracks. Spend a desert night at one of the ten campsites. It will come as a welcome surprise to find such a rich collection of wildlife in the middle of the desert. 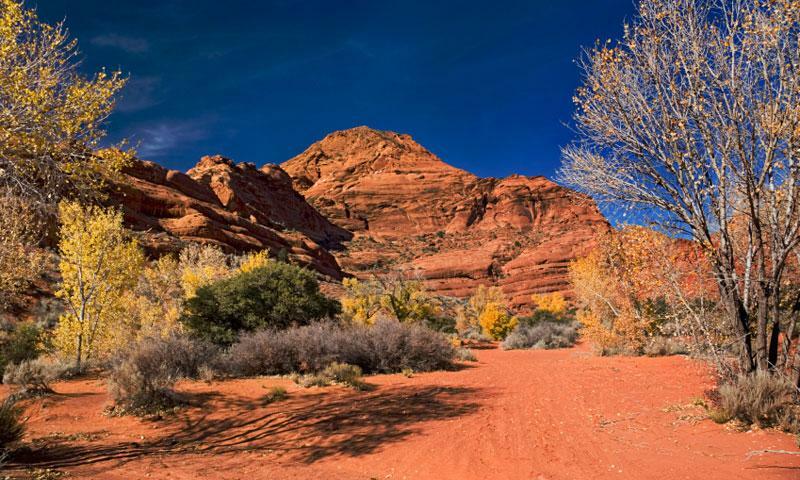 The Red Cliffs Recreation Area connects to the Red Cliffs Desert Reserve, with a riparian habitat that desert tortoises, banded gila monsters and others call home. Take the time to hike around the trails and visit some of the heritage sites. The area has a great deal of history, including mining towns and pre-historic Puebloan cultures. Red Cliffs, Utah, is located next to Quail Creek off I-15, just 14 miles northeast of St. George. If coming from the north, take exit 23. If coming from the south, take exit 22. From either direction, head south through the town of Leeds on Red Cliff Road, which will lead to the main parking area. Silver Reef Trail: At .16 miles long, this is an easy hike out to an overlook over the red cliffs and mining area of Silver Reef, where silver was once commercially mined in the late 1800s. Anasazi Trail: Less than half of a mile in length, this trail leads to an Anasazi heritage site. Prehistoric Puebloan sites have been covered, protected and interpreted for the general public. In addition, don't forget to find the dinosaur tracks in the area! Red Reef Trail: For those who are a little more adventurous and have a little more time, the Red Reef Trail is a great scramble/hike with dry falls and necessary trail-finding in the Red Cliffs Desert Reserve. For those looking to spend a night under the desert stars, ten campsites are available in the Red Cliffs Recreation Area, complete with picnic tables and toilet facilities. In addition to the ancient Puebloan sites of the Anasazi Trail, visitors can peer into the Orson Adams house, built in 1863 by the Mormon pioneer. In the world, Silver Reef is the only known deposit of commercial silver ore found in a sandstone formation.